To be user friendly not always a utility has to have a GUI you know ;-). 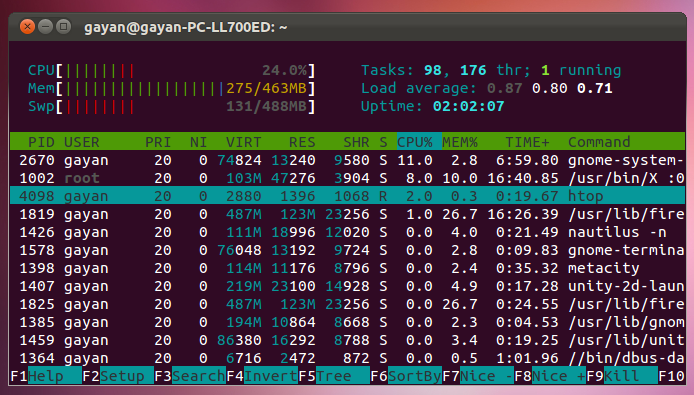 There are some decent amount of command-line based system monitors in GNU/Linux that one can try. nmon system monitor for instance is an excellent little tool. 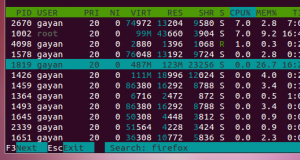 And another similar one (very popular) is the utility known as “htop”. 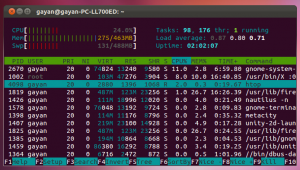 Being a command-line based system monitor it uses very little of your system resources while running. Just like with “nmon” it lets you change its appearance and enable/disable monitoring hardware devices. *. CPU, Memory (RAM) and Swap memory info are put on top of the window with “ncursed” based graphical bars which is cool! (supports “Bars”, “Text”, “LED” and “Graphs” output styles). *. System up-time, Average load and running processes are located on the top right corner. So a glance is enough to get a general idea of the suffering your PC’s going through at the moment ;-). *. And the rest of the screen is dedicated to the running processes with advanced information such as: User id, process id, NI (“nice value”: represents the priority of a process), CPU and Memory usage, Time elapsed, the path of the process execution and few other details. *. As you can see from the first screenshot, you can easily change the arrangements and other settings by simply pressing the “F2” key on your keyboard (other “F” keys are also being used to access various features of htop as well). Search, locate & kill … it’s all there! *. Change the update interval. You can also change the default look-n-feel (including the top “meter” location etc) of “htop” as it comes with few color themes too. If interested, you can install “htop” in Ubuntu 12.04 Precise Pangolin, 11.10 Oneiric Ocelot, 11.04 Natty Narwhal, 10.10 and 10.04 by simply entering the below command in your Terminal window. Just replace “1” with your preferred seconds interval. You can also read its manual by using the below command. 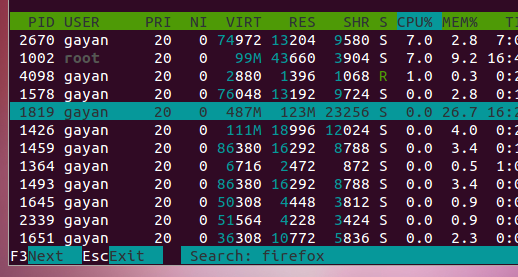 Although I’m not criticizing the default one in Ubuntu but as you can see from the below screenshot, “htop” being a “ncurses” and command-line based tool, it uses like 0.3 MB of RAM and 2% of CPU usage where at the same time Gnome system monitor uses about 7% of CPU and 2.8 MB of RAM. 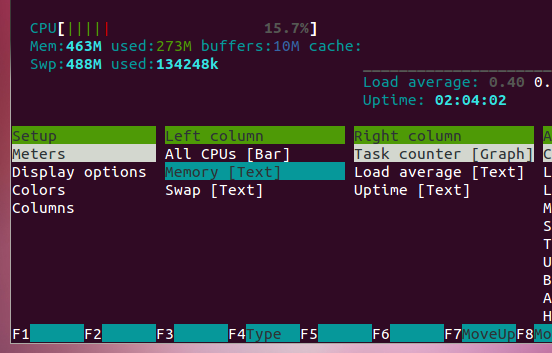 So when comparing system resources, htop is extremely lightweight too. So, if you want a fast loading, extremely lightweight system monitor that can be launched through command-line then heck, “htop” is a bloody serious looking utility, thumbs up!. Great little gem there. We’re running a heavy-lifting process on a virtual 24-core machine, and this was just the ticket for watching core utilization. SeaLion is another great free tool. Provides raw data in a great timeline on the UI. It’s very useful to debug a situation that occurred in the past. You can check it out at http://sealion.com. It could be useful to some sysAdmins who prefer raw data to graphs.